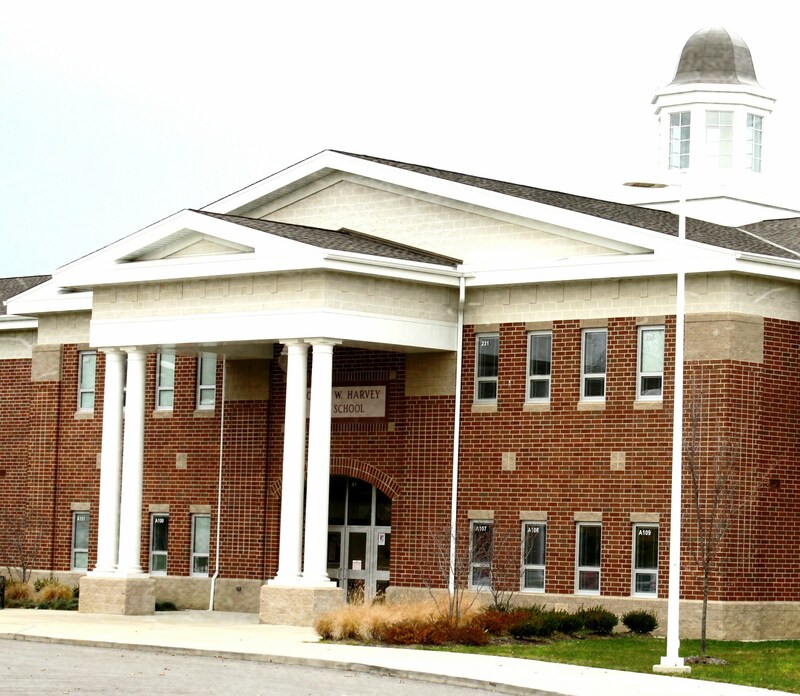 The construction of Thomas W. Harvey High School was the final phase of the Painesville City Local Schools’ district-wide new construction program, undertaken in partnership with the Ohio School Facilities Commission (OSFC) from 2005 to 2010. 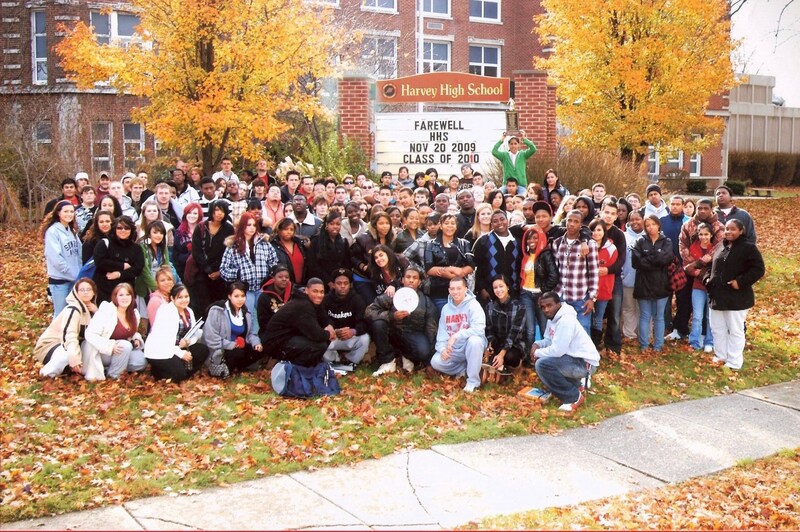 Harvey High School opened its doors to students in the fall of the 2009-10 school year upon the return from Thanksgiving break on November 30, 2009. The building was dedicated in December 2009. The new high school’s two-story formal façade is inspired by the area’s Western Reserve architecture. Classroom space is grouped by department with the academic wings linked to high-activity areas by a central connecting space which includes the media center and general purpose room, both of which can serve the community as meeting rooms. This arrangement minimizes classroom disruptions by isolating high-noise areas and also allows after-hours access to the public spaces while the academic wings are closed and unoccupied. The semi-circular drive at the front of the building serves as bus/student drop-off to separate pedestrian traffic from the parking lots. The center of this circular drive features an Alumni Walkway & Garden donated by the school’s Alumni Association. Substantial parking at the side of the building serves students as well as event parking and is convenient to the two public entrances. The large cafeteria/commons located between the Performing Arts Center and the Gymnasium also serves as an intermission space for events. The 1400 seat Gymnasium is surrounded by locker rooms, weight room, and physical educational classrooms. Locally funded mezzanines provide additional seating capacity as well as sports related activities including a wrestling practice room. The 680 seat Performing Arts Center, which was also a locally-funded initiative, is adjacent to the instrumental and vocal music rooms, the visual arts classroom as well as dressing and scene rooms. The building’s plan breaks the administration space into three areas, with the main administration and guidance offices flanking the main entrance, while the attendance & disciplinary offices overlook the student entrance. The entire facility is designed to accommodate state-of-the-art technology and also features high-efficiency heating and cooling systems. The cupola over the main entrance is a landmark feature...but it also serves a practical purpose. The cupola space is open to both interior floors to naturally brighten the hallways. The entire building was designed to take advantage of natural light as much as possible. Overall the design reflects a simple elegance that subtly reinforces respect for the educational institution. The building of the first high school in Painesville had originally housed a private school, the Painesville Academy. In 1852, the Academy’s trustees deeded the school building and grounds to the school board. This old grammar/high school was torn down in 1860 in order to build a new two-story brick building. Later known as the "Old Academy Building", it served as a grammar and high school until 1898 when Painesville High school was built. 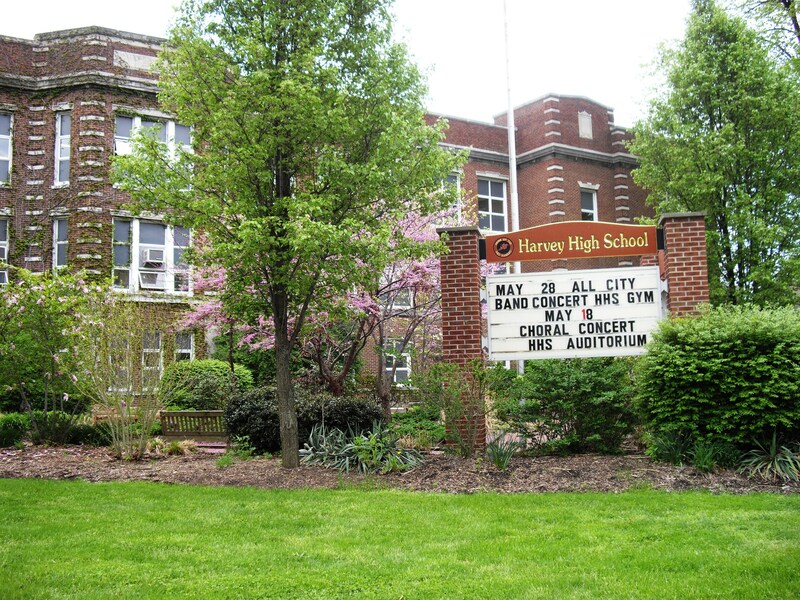 It continued to be used as an elementary school until the early 1920’s when it was razed to permit the construction of Harvey High School at the same site. 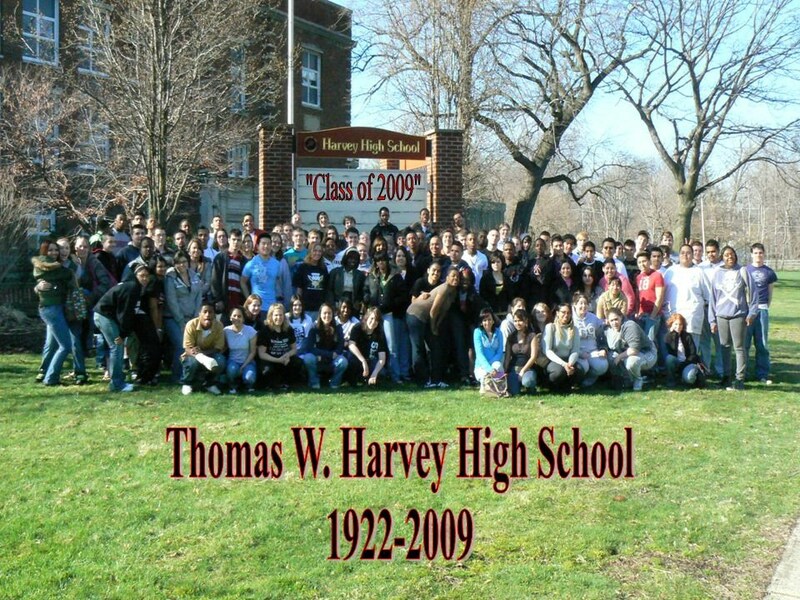 Harvey High School was named after Thomas W. Harvey, former district superintendent who gained statewide recognition as an educator and was dedicated in November of 1922. The building included classrooms, laboratories, a cafeteria, offices for the superintendent and principal, a gymnasium seating six hundred, and a combined auditorium/study hall. In 1924 a student government association was started on a small scale by permitting selected student to have honor study halls. It was after this experiment proved successful that all students were given the privilege of studying in an honor study hall. 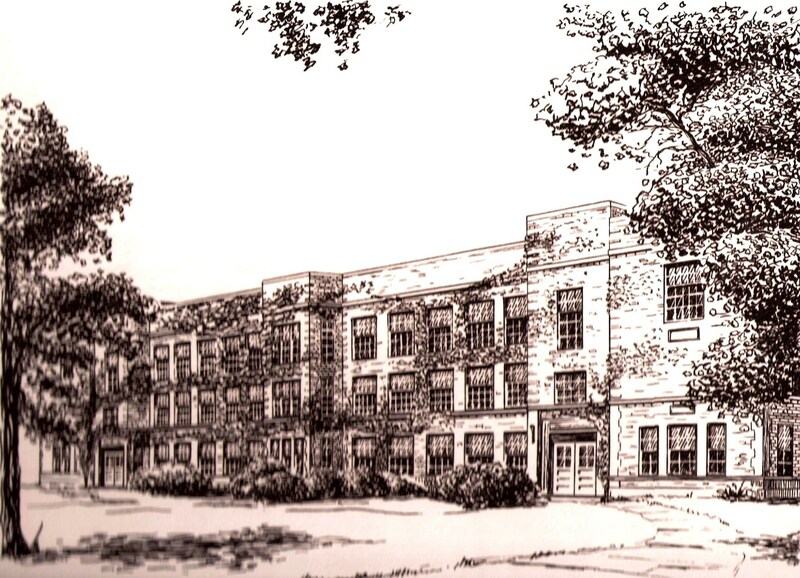 In 1952, a new wing was added to the east side of the building after the old Champion Junior High was razed. This wing included new classrooms, a cafeteria, a library, and an gymnasium. In 1965, the seating capacity of the cafeteria dining area was doubled by the construction of a $35,000 addition to the building. At the same time, the serving area in the kitchen was remodeled. Provision was made in the new addition for access to the library so that the added seating capacity could be used for study purposes. In 1968, and extensive remodeling program of the original building was initiated. 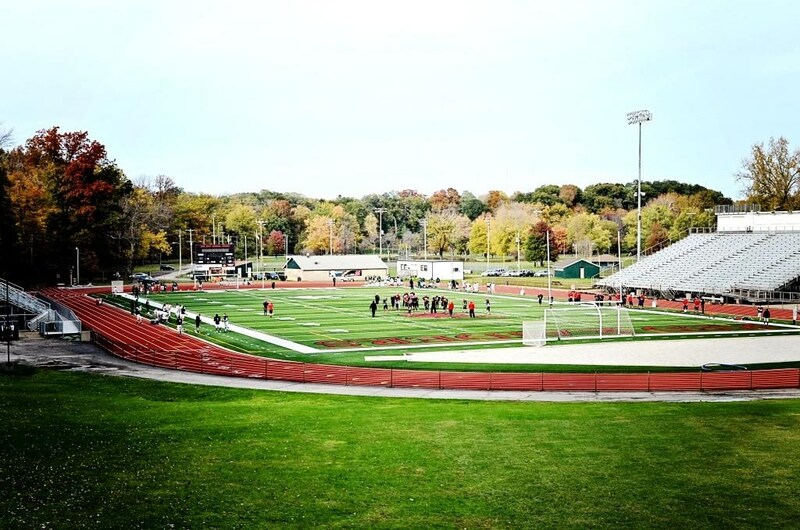 Rooms were redecorated and a new $65,000 locker/shower room facility was added for the girls. A two-phase construction program which started in 1970 was completed in September, 1972. 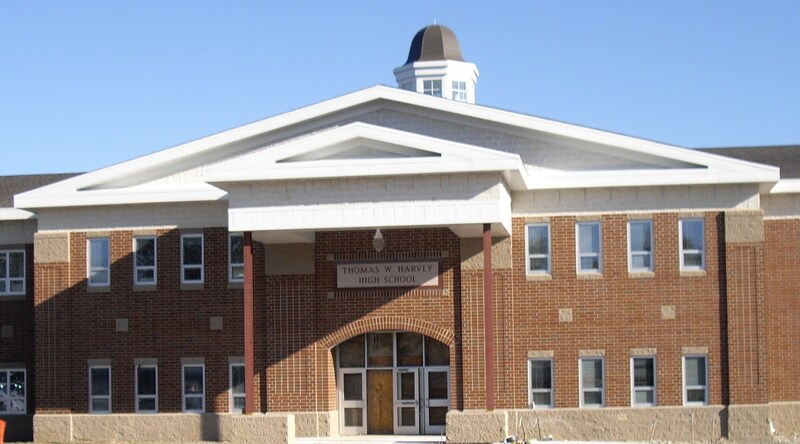 The third-story addition on the east end of the building added additional classroom space and enlarged and improved the home economics and business education facilities. Additional construction on the southeast side of the building increased space for the cafeteria and boys’ locker room. The next phase of construction was completed in 1976 and included a new suite of guidance offices, a new vocational wing, a new gym floor in the west gymnasium. This new vocational addition, located on the west end of the building, was named the John J. Britt Vocational Wing in honor of the former principal of Harvey and assistant superintendent of Painesville City Local Schools. This area housed the vocational auto mechanics, vocational electronics, industrial arts, metal shop, drafting, and photography rooms. The original buildings was demolished in the spring of 2010 after the opening of the new high school at 200 West Walnut Ave.